“Please write your name, home city and state, and your major on the index card in front of you,” requested Dr. R.
It was the first day of American History, my junior year of college. We all complied, and Dr. R. collected the 3 x 5s. He took a few moments to study each face and card, commenting or asking a clarifying question. Then he proceeded to name every person in the class of thirty or so students—without the cards. Quite impressive. 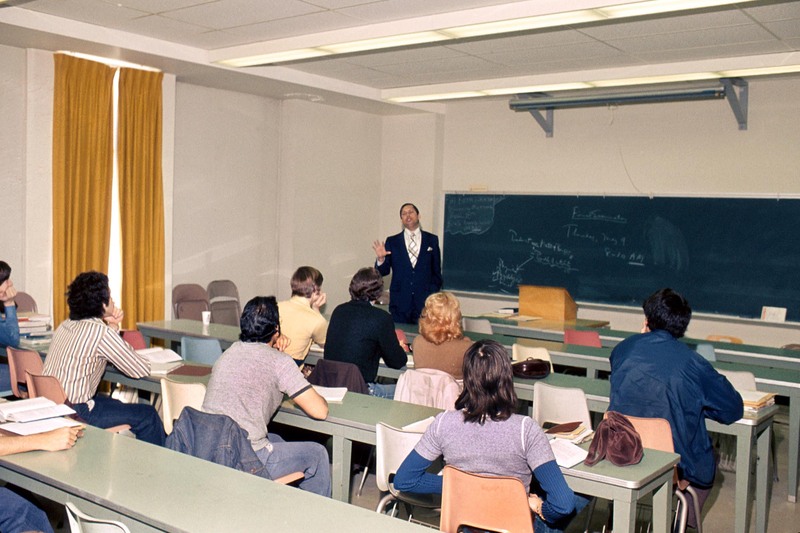 Each day that first week of class, as we entered the room, we’d see Dr. R., leaning against the front of his desk, reviewing those 3 x 5s. He always used our names when addressing us. On one occasion I ran into Dr. R. in the hall of one of the classroom buildings. “Hello, Nancy,” he called without hesitation. Now that might not seem very remarkable except I had graduated ten years before. Steve and I were on campus for homecoming. Not only did Dr. R. remember my name that day, he asked if I still lived in Wheaton, and if I was teaching. I wasn’t simply “a” Nancy who had been in one of his classes. I was “the” Nancy from Wheaton, who majored in elementary education. Who can remember such detail for so long?! And even if that moment was only the result of his incredible recall ability, I felt valued. Few people have such a gift as Dr. R. But I know Someone with an even greater capability to remember names and details. Too many, in fact, to quantify. 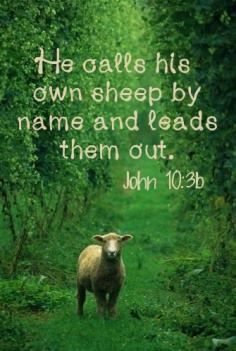 Jesus calls us by name (John 10:3). Our names are more than labels to him, identifying one person from another. He knows our character and personalities, as well as intimate details—our likes and dislikes, concerns, feelings, and thoughts. He knows one Nancy from another, one Steve from another, one __________ (put your name here) from another. However, calling us by name indicates not only profound knowledge about us but keen interest in us. He deeply cares about each individual (1 Peter 5:7). Now sympathy and compassion are comforting qualities, and Jesus demonstrates both. But true caring involves more. Care suggests action. And that’s exactly what he does. Jesus takes action when one of his own is in trouble (Luke 15:3-7). In fact, every detail of our lives is under his capable, loving control. His eye is ever watchful (Psalm 121:3). His ear is always attentive (Psalm 34:15). His heart beats with everlasting love (Jeremiah 31:3). His powerful hand brings help when the time is right (Psalm 138:7-8). “If you could see how close I am to you and how constantly I work on your behalf, you would never again doubt that I am wonderfully caring for you” (December 12). God knows each and every one of our names. When God calls, “Nancy” or “Steve,” “John” or “Jennifer,” he’s remembering who we are—our unique personalities, backgrounds, needs, and deepest thoughts. How compassionate our God is. Best of all, is the love in his voice as he speaks. And the benevolent action he sets into motion—specifically tailored to our needs. How astounding our God is. Heavenly Father, I thank you for taking personal interest in each of your children. To think that you know me by name—out of the billions of people throughout the centuries–what a precious reality. At those times I feel insignificant and small, may I hear your gentle voice calling my name. One of my favorite Bible stories is at the empty tomb when Jesus calls Mary M, by her name. He does know each of our names and that gives me chills to know. Thanks for the great reminder! You’re right–when Mary M heard her name spoken by the risen Jesus, her heart must have started beating wildly. Had he said, “Woman,” the story would not be nearly as heart-touching. Thanks Nancy. 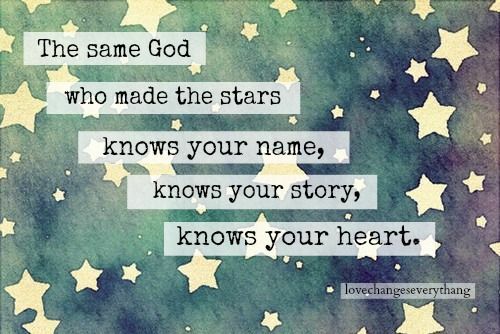 Isn’t it wonderful how much we are known by our God. It is a comforting thought. When I feel alone I will remember this from now on… HE knows my name (even the number of hairs on my head), He loves me throughout both my good and bad decisions. How comforting this post is, Nancy! By the way, who is Dr. R? Maybe I had him as well for a professor. Message me if you wish. 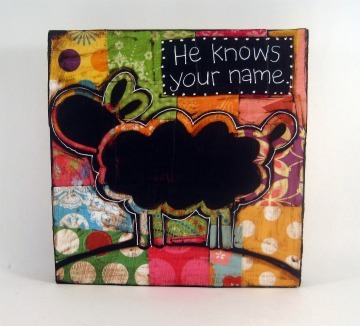 Indeed–Praise God for the comfort of his personal touch! I am just about to finish John Eldredge’s book “The Sacred Romance” “Drawing Closer the The Heart of God”. It is much to same theme, that God knows us by name and wants to be in a lively, active relationship with us. I spend a lot more time with Him, especialy in the early mornings. Since I got knocked off my donkey (car accident) and have more to spend in prayer, study and worship.